This is the main Android Go phone to wear an 18:9 display, it might be estimated around IDR 1.5 million in Indonesia, availability is as of now obscure. 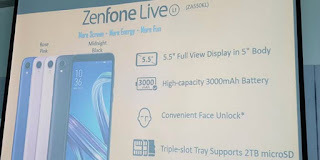 Taiwanese mammoth Asus on Wednesday is said to have reported that its most recent budget smartphone - the ZenFone Live L1 - will be launched in Indonesia on May 17, close by the ZenFone 5. Scratch features of the Android handset - which runs Android 8.1 Oreo (Go release) otherwise known as Android Go in one of its variants - incorporate Face Unlock, an 18:9 FullView display, and a triple-opening SIM/microSD card plate. This likewise makes it the primary Android Go smartphone to don an 18:9 display. The 1GB RAM variant will accompany Google's suite of applications worked for Android Go including Maps Go, Google Go, and Files Go. Official valuing and availability details for the smartphone are not yet available for Indonesia or other universal markets. The Indonesia launch was accounted for by Gadgetren, which claimed it will be valued around the IDR 1.5 million (generally Rs. 7,200) check. Shading variants of the smartphone incorporate Rose Pink, Midnight Black, White, and Blue. The dual-SIM ZenFone Live L1 will run ZenUI 5.0 over Android Oreo for the 2GB RAM variant and stock Android 8.1 Oreo (Go Edition) for the 1GB RAM version, out-of-the-container. The phone will brandish a 5.45-inch HD+ (720x1440 pixels) IPS display, with an 18:9 perspective ratio. It is said to be powered by a quad-center Qualcomm Snapdragon 425 SoC timed at 1.4GHz, coupled with 1GB/2GB of RAM and an Adreno 308 GPU. As far as optics, the ZenFone Live L1 can hold up under a 13-megapixel rear camera with PDAF and LED flash. On the front, the smartphone will brandish a 5-megapixel sensor for selfies and video calling. There is relied upon to be 16GB of inbuilt storage in the smartphone expandable up to 2TB (by means of microSD), with a 3000mAh battery fueling the phone from underneath the hood. 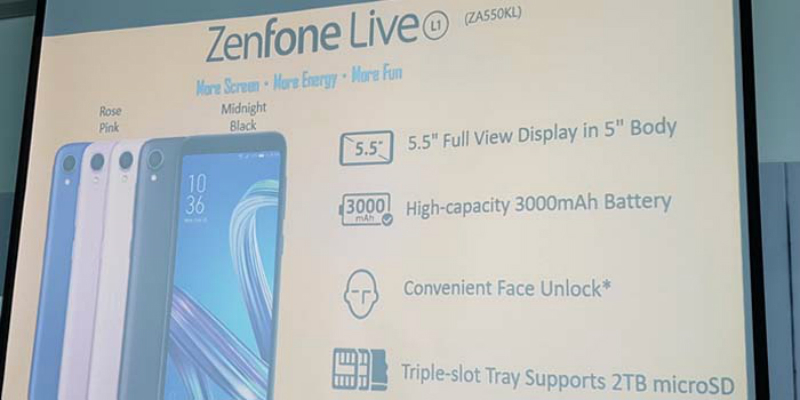 Connectivity alternatives on the ZenFone Live L1 incorporate 4G LTE, Wi-Fi, Bluetooth, and a Micro-USB port with OTG bolster. There is by all accounts no fingerprint sensor on the smartphone. Already, Asus had launched its most recent mid-go smartphone - the ZenFone Max Pro M1 in India. This smartphone runs a stock rendition of Android 8.1 Oreo and sports a 5.99-inch full-HD+ (1080x2160 pixels) display with the same 18:9 angle ratio.